How do I track down what email address is causing the non-delivery? The blurred out areas indicate our email server. 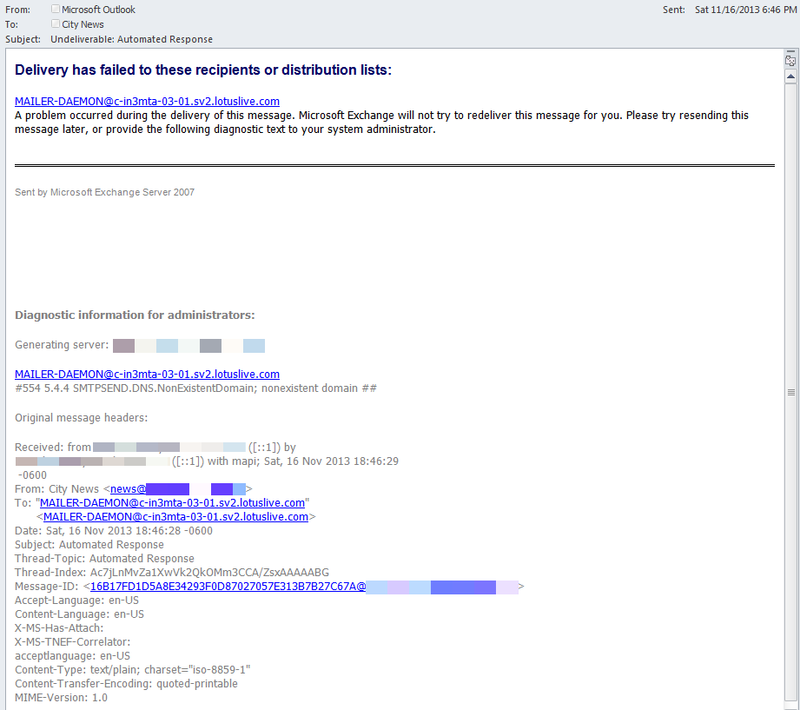 As you can see, there isn't any email address in there that tells me where the issue resides. I get several of these every time time we send out another news release everything is the same, but the date, thread index, and message id. I have been unable to find any of this in the email server's logs. How do I figure out what email address this relates to so I can remove it? 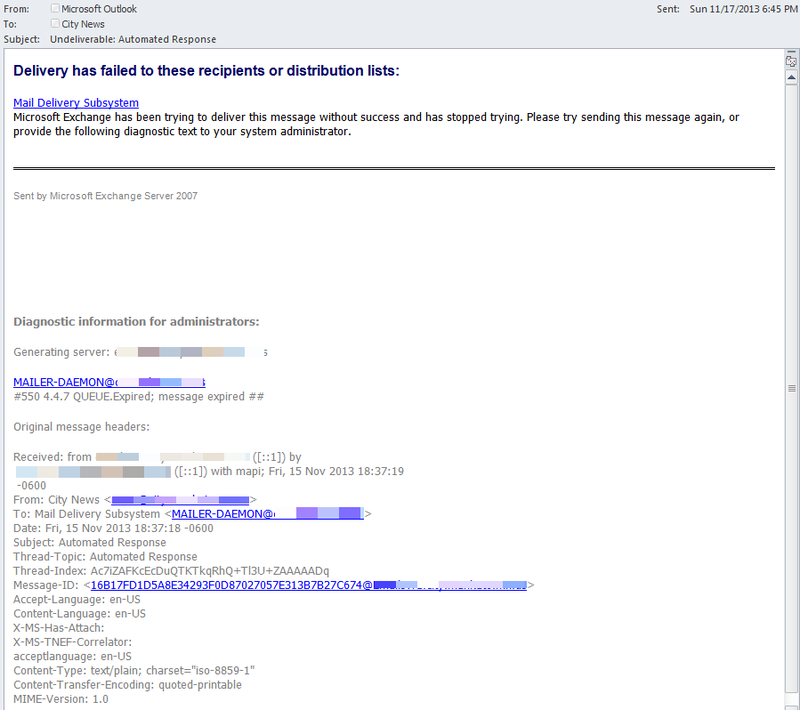 For context, the emails are generated on our web server using another email server software. Our primary email server is running Exchange. I have talked to our email server admin about this problem, and they don't see anything in their logs. Update: Here is another type I get with the same problem. I understand what the error means, but how do I know what that domain is? Maintaining a big mailing list can involve a fair amount of detective work. Much of this is caused by MS Exchange, and other mail servers who think it's a great idea not to use 5xx SMTP codes to indicate unknown users, but to accept email for everyone, then generate new emails to inform senders that some users don't exist. To make life even more fun, the format of these "replies" can be configured, so you can't rely on a standard-format response. When those go back to mailing lists, some list software doesn't recognise the cute, custom "No such user" email, and generates a new "I don't know what you're talking about" email, which goes back to the system account from which the original "No such user" email came. These can bounce back and forward for a while, until finally an automated reply (to an automated reply)^n to a no-such-user automated email (for large n) reaches a human being, who then has to start working out which invalid subscribed user caused the original email. accepting that I'm never going to find out who it is, and involving procmail or some similar filter to suppress the final error, so I don't have to read it each time a legitimate mail is sent to the list. In short, there's no single answer; patient detective work is called for, and that's just part of the boulot of a list admin. Good luck. To finish up this question. I did find the cause. The email server we were using wasn't quite configured right. One of the settings referred to the bad domain. I updated that to use the right domain and now I no longer get those messages. Not the answer you're looking for? Browse other questions tagged email or ask your own question. Why is my email server in AT&T's blacklist? How do I Forward root's email to an external email address? I have a Google Apps account using a co.cc domain. Co.cc have shut down (and deleted all domains) and I caanot recieve email. What do? Emails bouncing from Verizon.Net & Aol.Com, how to fix?